One needn't leave Las Vegas to get an authentic taste of Paris. 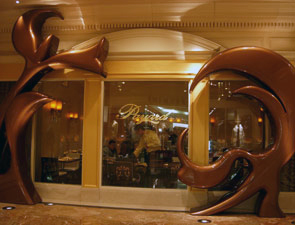 It's right here at Caesar's Palace, at Payard Patisserie & Bistro. C'est arrive! Located in the high-traffic space next to the convention center elevators, near an entrance to the Garden of the Gods Pool Complex, the bistro gently beckons with its subtle aromas of baked-from-scratch pastries, decadent dark chocolate and freshly brewed coffees. Heck, one can even get a free sample from the Chocolate Clock that regularly dispenses wrapped chocolate truffles. And if that doesn't entice you, then the creperie station just might. This David Rockwell-designed restaurant includes a full-service dining room with an open exhibition kitchen, a chocolate shop and a pastry shop offering not only pastries, but also individual sandwiches, made-to-order crepes, homemade seasonal ice cream and more, all of which is perfect for snacking on while you're on your way to your next convention meeting! Whatever you crave, give in to the restaurant's gentle aromas and let them take you off course for just a moment so that you can try some of award-winning Pastry Chef Francois Payard's delicate creations. You won't be disappointed. 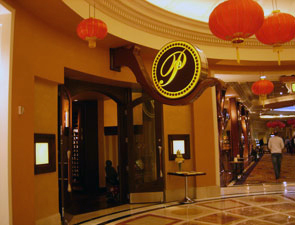 Pastry Counter: 6:30 a.m. – 11 p.m.